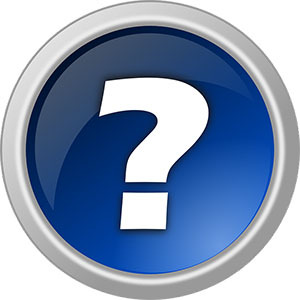 What is good in the Roomba 890 pet hair vacuum? The Roomba 890 is the best model in the iRobot 800 series and a great deal for homes with pets. It may not be the top of the line model, but in the same token, it isn’t your cheap vacuum like the 675 and 690. This one comes with several improvements including a 2nd Generation motor, the same one that iRobot 960 comes with. 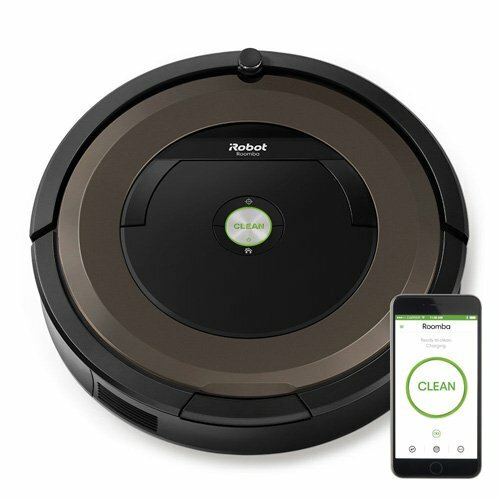 It is the perfect iRobot vacuum for any homeowners who want some of the top iRobot features without breaking the bank. 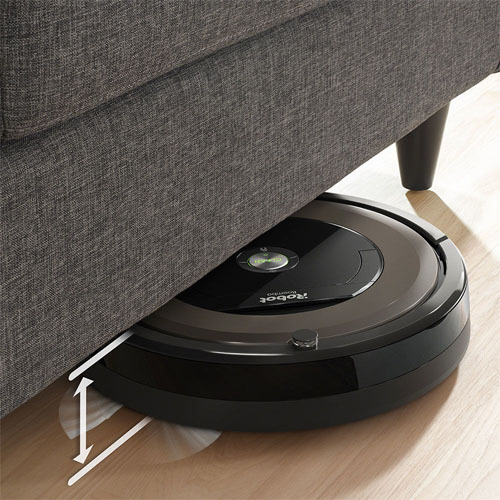 The iRobot 890 boasts a round shape just like all other Roombas, and most vacuum cleaners in general and weighs 8.4 lbs. It has a 13.6-inch diameter and stands at 3.6-inches high. Under the hood is a 0.3L dust bin that also has a full bin indicator. Aesthetically, the 890 has been finished in black and copper. At the top, we have three buttons including one large CLEAN button and the iRobot logo at the top. Around the vacuum, we have the bumper ring which cushions the vacuum by retracting in the event it hits an obstacle. In the package, you will find the vacuum itself, the docking unit, a single dual-mode virtual wall barrier, an extra filter and brush, and the warranty. 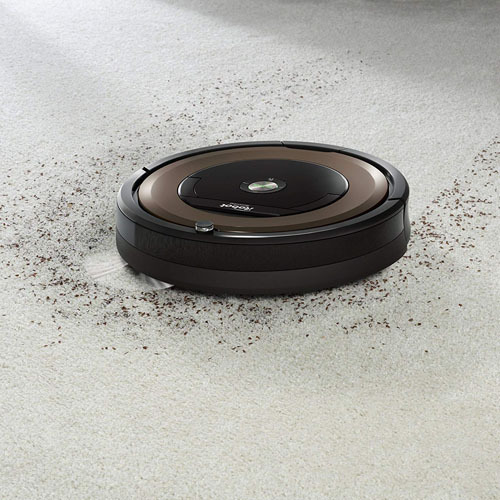 The iRobot 890 has the AeroForce 3-stage cleaning system. It sweeps, agitates dirt, and picks it up in the final stage. One of the most significant additions is the 2nd Generation motor that delivers five times more air power. This is the same motor that the Roomba 960 has, and it produces around 900 Pa. The suction is enough to pull pet hair and all kinds of dirt into the bin. It also features a new and improved brush system. There is one brush for agitation and another for picking up the dirt. Unlike the previous models that used bristle extractors, the 890 and later models have rubber extractors. The brush also has an anti-tangle mechanism which prevents tangling especially if you have the long-haired dog breeds. Another upgrade to this Roomba is Dirt Detect Series II which use optical and acoustic sensors to find where there is concentrated dirt. Remember, the previous models have Dirt Detect Series I that use acoustic sensors only. The Roomba 890 has been designed to handle all types of bare floors including tile, vinyl, and linoleum. We tested it using the daily household dirt like Cheerios, sugar, flour, kitty litter, and sand pebbles. All the dirt was collected though there were a few patches of flour left behind. It is also suitable for low pile and medium pile carpets, but on the high pile, you won’t get satisfactory cleaning because of the average suction power. On low pile, the iRobot 890 collected most of the dirt save for the tiny flour and sugar particles. This is the same case for the medium pile, but on the high pile, the 890 was overwhelmed and managed to clear only the large dirt particles. 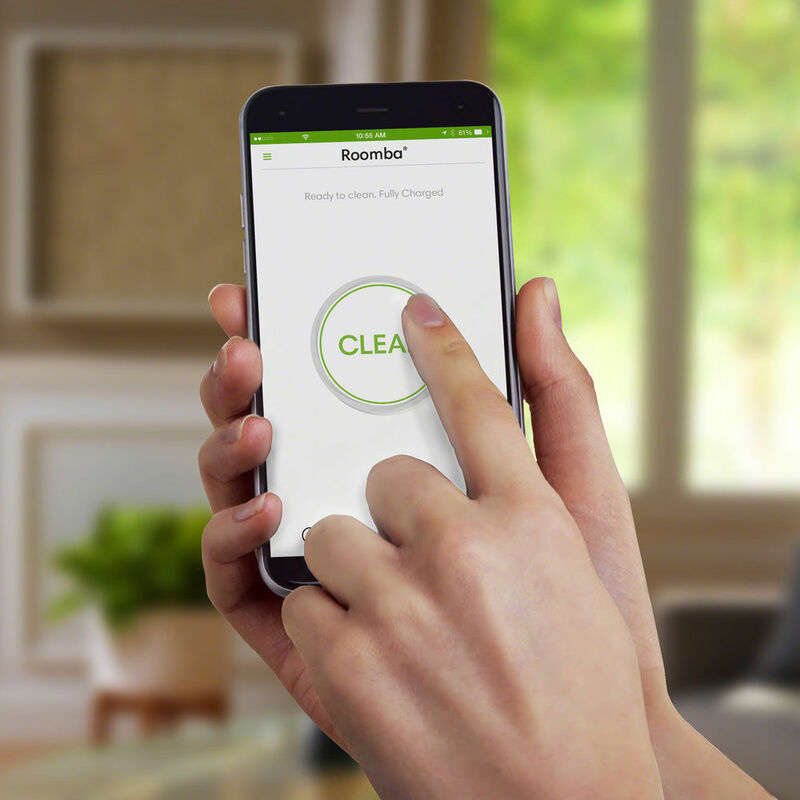 The Roomba 890 boasts the proprietary iAdapt 1.0 navigation system. This is a SLAM (Simultaneous Localization and Mapping) navigation meaning it relies on sensors only to find it’s position in your house. 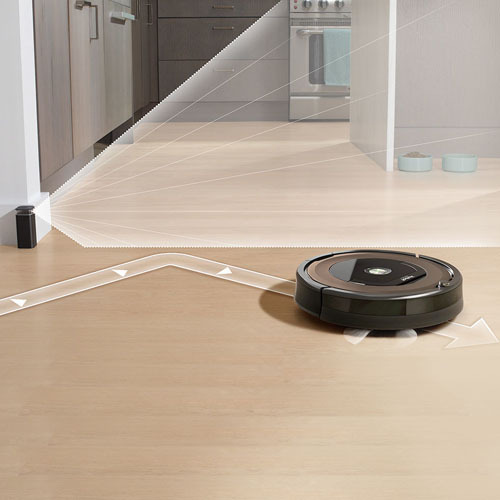 It comes with obstacle detection sensors that enable the robot vacuum to slow down when there is an obstacle ahead. Under the vacuum, we also have anti-drop sensors that detect stairs and other drop points. We tried it out in a house with average traffic, and it did a great job. We pushed it further by adding obstacles around; it hit some a few times and even got stuck. It is not the ultimate robot vacuum for high traffic rooms and large apartments but offers better accuracy than the competition. 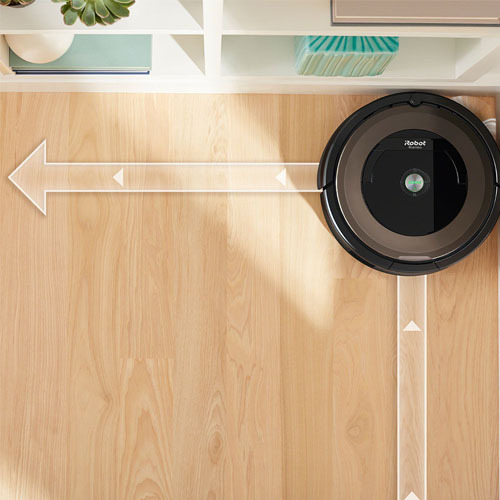 When it comes to floor mapping, there is a memory-mapping function, and this means the vacuum remembers the significant landmarks in your house. However, it is still not a fully methodical pattern but it helps a great deal in ensuring the robot vacuum doesn’t clean the same spot twice like old vacuums. In a large apartment, it noticeably took longer to clean and missed some spots, but in averagely sized floors, it delivered. Another talking point would be boundary marking, and just like the earlier models, iRobot 890 comes with Virtual Walls. For starters, this is a technology that allows homeowners to set boundaries for the cleaner. For example, you can limit the robot vacuum from accessing the dog feeding area among other zones within the house. Please note that only one Virtual Walls node is supplied so getting an extra one should be part of your plans if you want to get the most out of this feature. As for maneuvering, we haven’t seen any changes. The Roomba 890 still maintains two large off-road wheels that can climb obstacles up to 1.6cm high. The head is still self-adjusting so be sure of the right brush contact whether you’re on bare floors or carpets. 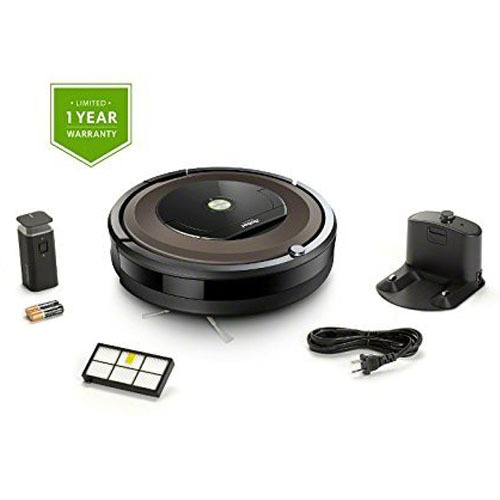 The Roomba 890 is powered by a rechargeable Li-ion battery with a 1800mAh capacity. This is the same battery that comes with the older models and runs for approximately 60 minutes on bare floors. On carpets, the runtime is a little bit shorter because the cleaner requires more torque, and that means more power. In the market, you will find several replacement batteries with much higher capacity. So if you have a large apartment that can’t be cleaned entirely on one charge, consider getting a much powerful battery with over 1800mAh. Regarding power management, this Roomba will automatically go to the charging base once the battery is critically low. The recharge time is between 2 and 3 hours, but unfortunately, it won’t resume cleaning. You have to manually initiate the cleaning once again, either on the physical buttons or via the Smartphone app/ Alexa. This robot vacuum cleaner supports Wi-Fi under the 2.4GHz band. This means homeowners can operate it via the iRobot HOME app or Alexa/Assistant. Remember, not all Roombas in the 800 series have Wi-Fi; for example, the 805 can’t be operated via Smartphone or Alexa. The scheduling function is also available and allows the iRobot vacuum to be programmed for seven days straight. This can be done on the App or the physical buttons. The iRobot 890 has a retails price of around $500. But still, you can get it at a reduced cost so make sure to sign up for our price drop alerts, and we’ll notify you when the price comes down. If you are looking for the best value for money, Roomba 890 is the real deal. The vacuum comes with a powerful motor and a new brush system. It is definitely better than iRobot 675 or 690 that come with the first generation motor and bristle brushes. We say this is a great deal because you get these extras for just $150 extra. Does Roomba 890 work on carpets? It depends on the type of carpet in question. If you have the low and medium pile carpets, this vacuum will do a great job. However, on high pile carpets, it gets overwhelmed and won’t thoroughly vacuum it. Does Roomba 890 learn the rooms? Yes. Even though it is still based on iAdapt 1.0, Roomba 890 creates maps of your house to help it know where it has cleaned and where it has not cleaned. What’s the difference between iRobot 890 and 690? If you are keen with the finish, you notice that Roomba 690 has been finished with a silver accent on black while 890 has a copper accent. Besides this, the 890 has a Gen 2 motor that delivers 900 Pa while 690 has a 1st Gen motor. 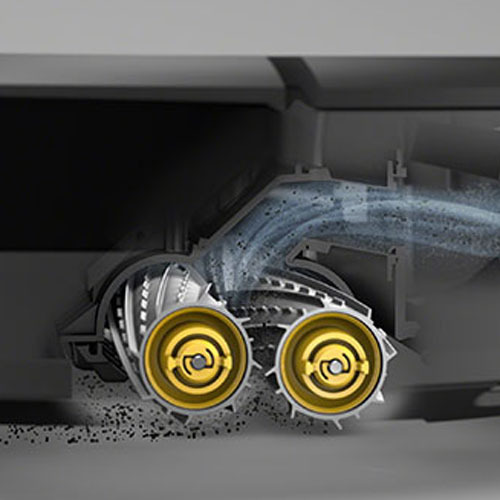 The 890 also uses the AeroForce 3-stage cleaning system while 690 has Aerovac. The former also has Dirt Detect II while the latter uses Dirt Detect I. There you have it; a Roomba 890 review. If you have hardwood floors and pets, this is the real deal. It is affordable and offers some impressive features the older iRobot vacuums lack. The only concern is that it is a little bit loud at 68dB and will not navigate seamlessly in high-traffic rooms. But considering the new motor it has and the price you are paying, it is a sweeter deal than the 675 and 690. Make sure to sign up for our price drop alerts, and we’ll notify you when the prices come down.